The area now known as Alhambra Cemetery started out most likely as a spontaneous burial site and went by many names. When exactly is unknown but there are two different theories that have emerged. The first theory has it starting approximately in 1829 with the cremation of Native American Slaves, (from the Pinion Indian Tribe who used funeral pyres to honor their dead) owned by the former Spanish missionaries on their way to Santa Rosa. The second theory has it starting approximately in 1831 with the migration of Monterey settlers on their way to the Sacramento area. It was common for cemeteries in the West to be started by settlers, who lost a child or other loved one, by looking for a high point along the way to bury their dead. High points were most desirable because it allowed your ancestors to be closest to God. 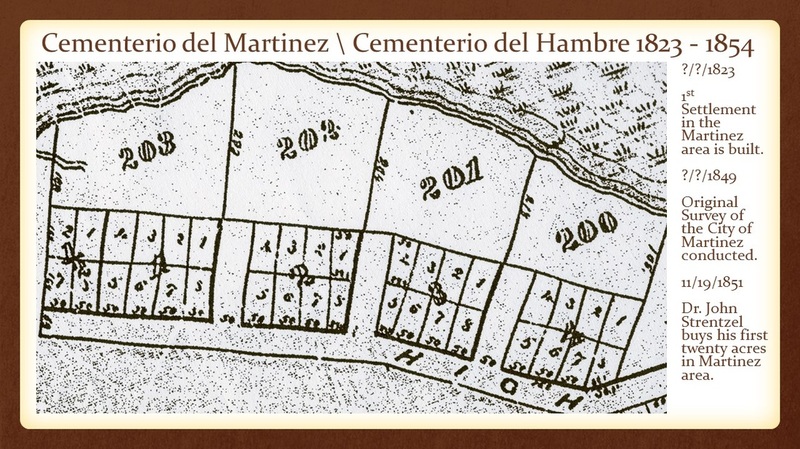 However we picked the date of the first Martinez settlement of 1823 as our approximate starting point. There are no records that we know of to confirm either of these theories, but they are derived and supported by other well respected researchers' work regarding the history of Alta California. The Original Survey of the City of Martinez within the "Rancho El Pinole" land grant is commissioned by Col William Smith, in 1849. The existing cemetery included the first blocks surveyed (1/2, 1, 2, 3, & 4) and some of the last surveyed (200,201,202,203). The founder of Martinez later commited suicide in 1854 and was buried unceremoniously in an unmarked grave most likely within Potter's Field (where a number of other suicides reside, as it was a disgrace to die by ones own hand irregardless of one's status in life). Important dates of note: On September 9th, 1850, California officially becomes a state of the union.